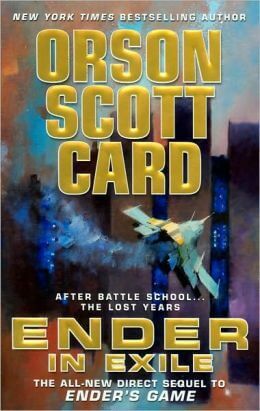 Ender in Exile is a newer book from Orson Scott Card, author of the sci-fi classic Ender’s Game. Ender’s Game is some of the best sci-fi from the past thirty years: its masterful psychology and unexpected action are original and, in my opinion, enduring. I’ve reviewed the book twice before, and it still stands very near the top of my favorite sci-fi. I couldn’t resist a boxed set of Ender’s Game, Ender’s Shadow, and Ender in Exile — a new book. For the most part, though Exile has an interesting story, it lacks the enduring qualities of its older brother. Much of the book spans the others, chronologically. It’s sort of a side-quel that resolves small plot lines left hanging in the main books. Unfortunately, this makes things feel disjointed from the other books. There are some great nods to major events in other books that fans will appreciate, but in general the plot feels stuttery and disjointed. Ender’s Game had one huge plot point: save the world. In comparison, Exile feels like it’s running around trying to do several things. When I found out that the book was compiled from several short stories, it only confirmed this feeling. At best, the book feels like some nice fan-service. At worst, it feels like a cheap attempt to get a little more cash out of the universe. Part of what makes Ender in Exile so frustrating is the chances it has to dive into humanity that it totally misses. The relationship between Ender and Alessandra, a minor plot point, receives a good deal of attention in the book, but it’s lacking the depth into Ender’s mind that we see in other books. Sure, there’s some great psychological dialogue in there — this is Orson Scott Card, after all — but it lacks the depth of previous books. That sums up the book as a whole: there’s great writing inside, even some sharp dialogue, but the plot seems tangential and doesn’t build on those foundations to make a fantastic book. That said, if you’re a fan of Ender’s Game (or any of the other books in the Ender world), it’s hard not to recommend Ender in Exile. It’s fun to stick with the characters for another story, and as I’ve said the writing is pretty top-notch even if the whole package is a little lacking. Fan-service or not, I enjoyed Ender in Exile. If you’re new to the books and the author, however, you owe it to yourself to start with Ender’s Game. It really is a must-read, and Exile stands behind it for sure. Next Post:Championship Fathering Previous Post:All the Places to Go, How Will You Know?